This is a tough question every student preparing for the DAT faces. Here’s the truth: you’ll never feel ready (unless you’re one of those prodigies who only studies for a week). Even after studying for 3 months on every kind of material I could get my hands on, I didn’t feel like I was at fully prepared walking into the test center. I remember looking over my biology notes in the parking lot and thinking to myself I still knew nothing. This is why I don’t recommend doing any sort of review the day before or day of; you’ll only make yourself nervous. So how do you tell when it is time to take the DAT? There are two ways you can go about it: qualitatively and quantitatively. Both of them work and have their own advantages. The first is by feel. If you feel more excited to get the DAT over with than nervous that you’re going to bomb it, you’re ready. This is the feeling I had walking into the DAT. I figured there wasn’t much else I could do, and even though I didn’t feel ready, I felt that I wanted to take the test and get this over with. I knew that freedom was only 5 hours away and I was ready to go for it. The second method is quantitatively, which can be hit or miss. If you’re consistently scoring 20+ on all of the sections in your practice exams, you’re ready. 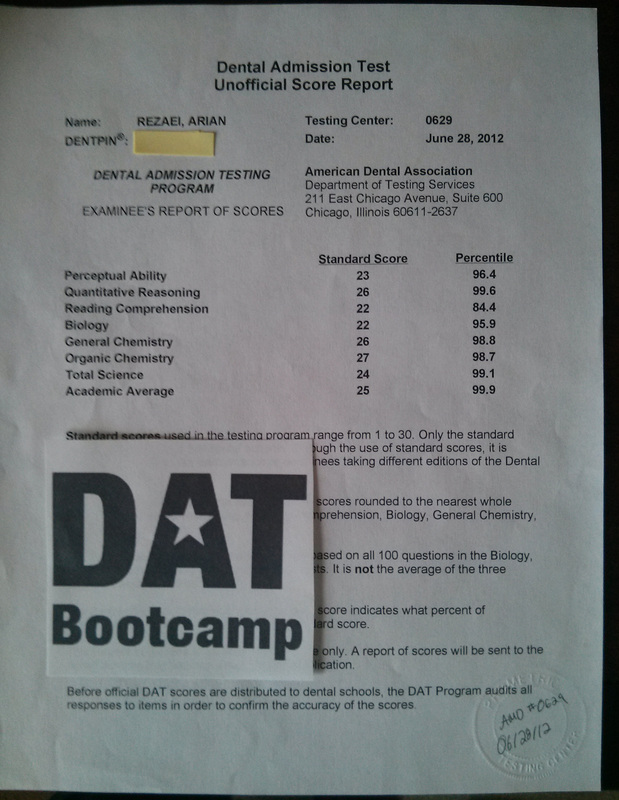 The big tell-tale sign though are the scores on your 2007 and 2009 ADA DAT practice tests, AKA the last two full length DAT practice tests you take. The scores you get on these tests are going to be very close to what you score test day. If you do not like your scores on the 2007 and especially the 2009 ADA DAT practice test, seriously consider rescheduling. Think about what you could do if you had an extra few weeks. When I rescheduled, I made a game plan of all the DAT practice tests I would do each day, and the days I would have for topics to review. This way I wasn’t just delaying the DAT to procrastinate, I was delaying the DAT to better prepare myself and stick to a pre-made study schedule. Both of the methods above work differently for different people. Some people like to decide things by feel, and others like numbers. One thing is for sure, if you have a strong gut feeling that you’re more excited to finish the DAT and get it over with, and your DAT practice test scores are very high, you are in a good spot to say you’re ready to take the DAT.